This is an appendix to the post on “designing for correctness”. In this post, I’ll demonstrate why the solution is not as straightforward as you might think. A shopping cart might have states Empty, Active and Paid. You can’t do anything with the Paid state. Once paid, the cart is immutable. In an object-oriented language, the standard approach is to use interfaces and inheritance. There is a class for each state, and each state inherits from a common base class or interface. But where should the custom behavior live? For example, should the “Remove” method be available at the interface level or not? But what should the empty state implementation do with the methods that are not relevant? It can either throw an exception or ignore them, as shown below. Throwing an exception seems a bit drastic, and ignoring the call seems even worse. Is there another approach? The next approach is that the base interface should only have genuinely common code, and each subclass implements its own special behavior. 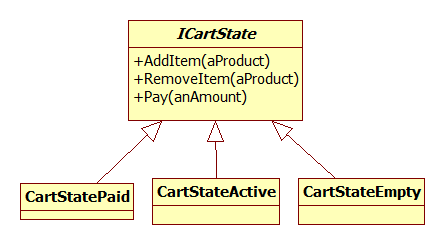 This is much cleaner, but now the question is: how does the client know which state the cart is in? var cartStateEmpty = currentState as CartStateEmpty; //CAST! var cartStateActive = currentState as CartStateActive; //CAST! But this approach is not only ugly, it’s all error prone, as the client has to do all the work. For example, what happens if the client forgets to cast properly? And what happens if the requirements change and there are now four states to handle? These kinds of errors will be hard to catch. In OO design, a reliance on this kind of branching and casting for control flow is always a sign that polymorphism is not being used properly. And indeed there is a way to avoid downcasting by using so-called “double dispatch” or its big brother, the visitor pattern. The idea behind it is that the caller does not know the type of the state, but the state knows its own type, and can call back a type-specific method on the caller. For example, the empty state can call a “VisitEmpty” method, while the active state can call a “VisitActive” method, and so on. In this way, no casting is used. Furthermore, if the number of states increase, the code will break until a handler for the new state is implemented. Now we are ready to use it – and here is where our problems start! Because, for each different set of visitor behavior, we have to implement a custom class. For example, when we want to add an item, we have to create an instance of AddProductVisitor and when we want to pay for something, we need to create a PayForCartVisitor. Phew! It does work, and it is polymorphic and type safe. But it seems like an awful lot of scaffolding is needed just to do something straightforward. An interface, two new classes, and nine new methods! Compared with the second approach, you can see that it is a lot more complicated. And this is a simple example! It reminds me of the “Kingdom of Nouns”. Surely there must be another way – combining the simplicity of the second approach with the safeness of the visitor approach? The F# code gives us a clue on how we might solve the problem in C#. The idea is that for each possible state, we pass in a lambda specifically designed for that state. We do this through a single method call. In other words we provide a list of functions but we don’t know which one will actually get evaluated – we let the cart decide, based on its state. It is completely idiot proof. A client of the interface always gets a valid value back. The client cannot mess things up by forgetting to cast or forgetting to check for null. Illegal states are not even representable. A client cannot call the “wrong” method, such as calling “Pay” on an empty cart. The compiler will not allow it. Because of this, there is no need for runtime errors or “not implemented” exceptions. If the number of states ever changes to four say, just add a new parameter to the Transition method. The Transition method will now take four lambdas, so all your existing code will fail to compile. This a good thing! You cannot accidentally forget to handle a state. The code is simple and low complexity. Just as in the second approach above, each state only implements the methods it needs to, and there are no if statements or special case handlers anywhere. In a way, this is what the visitor pattern was trying to get at in its complicated way, but the use of inline lambdas rather than whole visitor classes reduces the complexity immensely. Well, I hope you found this interesting and useful. It’s definitely a different way of thinking if you are not familiar with functional programming.